Taking special effects and sound to a new level Jack the Giant Slayer entertains with adventure and excitement. The audience for the film targets teen males to thirties and women who like action films. The movie will be released on Blu-ray in a special combo pack that includes the DVD, UltraViolet and a code for a 14 Day XBOX Life Gold Trial on Tuesday June 18. If you are an adventure film addict and enjoy movies like Journey to the Center of the Earth or 300 than this movie is your golden egg. From here the movie gets more adult driven with Jack dropping into the local pub where the entertainment features a lot of ‘fooling' around. Here he spots King Brahmwell's (Ian McShane) daughter Isabelle (Eleanor Tomlinson) being bothered buy some drunk patrons and comes to her aid. The King's men led by Elmont (Ewan McGregor) arrive and whisk her away to the castle. Jack leaves the tavern and sells his horse to a Monk (instead of a peddler as you will see why later in the film) for some special mysterious beans. Jack arrives home and his father gets upset over the beans with one of them dropping through a crack in the floor. In a rainstorm sometime later he runs into Isabelle who he brings to his house for shelter. When a drop of water hits the bean that fell though the floor an astonishing beanstalk grows carrying off Jack's house with Isabelle with it. There are bonus features with the Blu-ray combo pack that include UltraViolet capabilities, the DVD and a code for a 14 day Xbox Live Gold free trial. "Become a Giant Slayer" Here's a very cool game that you can play by climbing a beanstalk. On the way up you can choose to see some videos on how scenes were made. "Gag Reel" A short reel, but fun. I especially liked the cat training session. There's a very good visual quality to the film played on my 16x9 HD TV. The special effects and CGI provide terrific giants, huge castles and a fantastic countryside. The 2.4:1 aspect ratio gives you the whole theatrical width of the film, but does have bars top and bottom played on my system. The sound quality is very vibrant with crystal clear dialogue and very good special effects. The difference between using my television's speakers and my upgraded system show little change except for the surround. Whether you use the DTS-HD Master Audio 5.1 for the Blu-ray or the 5.1 Dolby Digital on the DVD you should get nearly the same quality experience with no distortion. Jack the Giant Slayer has been rated PG-13 by the MPAA for intense scenes of fantasy action violence, some frightening images and brief language. Be cautious when deciding to allow anyone under 13-years-old view the film without an accompanying parent as it does have some scenes that may be inappropriate due to some very gruesome visuals. 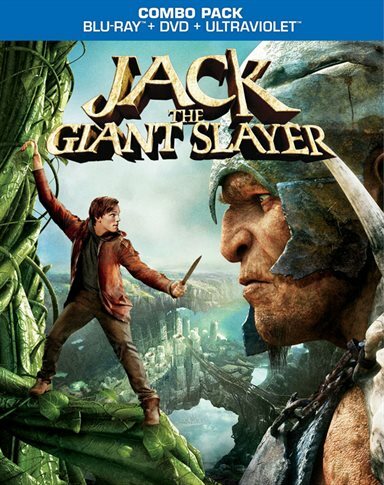 Download Jack the Giant Slayer from the iTunes Store in Digial HD. For more information about Jack the Giant Slayer visit the FlickDirect Movie Database.